Toystore - what can you order ? We currently have a limited stack of all 2015 – 2018 and Jan 2019 back issues They are $5 ea plus $2 s/h. DX please email for current rates (they have really been going up lately!). The latest version covers all issues including the latest issue. DX please email for the current shipping rates. QRP ARCI mug. E-mail for current shipping rate. 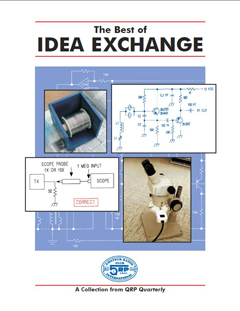 QRP ARCI announces the publication of a new book - "The Best of Idea Exchange"
This will quickly become a needed information source for your work bench. The content is drawn from 20 years of the Idea Exchange in past QRP Quarterly magazines. This is an excellent resource full of useful data. We hope you enjoy it. $25 PPD. DX send an e-mail for current shipping rate.